Northeastern Nigeria's Boko Haram rebels, despite being pushed out of most of the territory they held last year, are still a major force in the region. After becoming an official affiliate of Iraq and Syria's so-called "Islamic State" (IS, a.k.a ISIS/ISIL) last March, they have now taken to calling themselves the Islamic State's West Africa Province (ISWAP). The goal of IS is to capture and hold territory, and Boko Haram still hangs on by a thread in that respect. Though the extent of their control has been blurry over the past six months (there is extremely little independent reporting from the region), military forces of Nigeria and neighboring countries have continued to announce the "recapture" of towns - an implicit acknowledgment that territory continues to be hotly contested. Since this summer, the Nigerian government has stepped up aerial attacks against Boko Haram hideouts in the Sambisa Forest, but the result seems to have been a flood of fighters into nearby communities on border with Cameroon, while the forest remains an area of murky control. *There are hundreds of local and regional languages in Nigeria, but only English has official status. The following is a timeline of major events and changes to territorial control in northeastern Nigeria and neighboring countries since our previous update of May 28, 2015. Note that Boko Haram launches deadly attacks on an almost daily basis across northeastern Nigeria, frequently on Cameroon's side of the border, and occasionally in Niger and Chad as well. This timeline focuses on changes of territorial control, adding in selected items representing the biggest news and most significant cross-border incidents. 2015.06.14 Boko Haram fighters sacked the town of Babbangida, north of Yobe state capital Damataru. 2015.06.15 Boko Haram carried out a bombing with heavy casualties in N'Djamena, the capital city of Chad. An important Boko Haram leader would be captured in the city two weeks later. 2015.06.17-23 A deadly Boko Haram attack on Gueskérou, Niger was answered with a five-day long air and ground campaign by that country's armed forces. 2015.07.01-02 Boko Haram killed almost 200 people in two days, in a wave of attacks across Borno state. As of last March, Boko Haram considers itself the West African branch of the Syria- and Iraq-based "Islamic State" (a.k.a. ISIS/ISIL). The July violence in Nigeria, targeted at non-extremist Muslims, coincided with an IS directive to increase attacks during the Muslim holy month of Ramadan. 2015.07.22 A village in the Hile-Alifa area of Cameroon was reportedly occupied by Boko Haram, two days after a brutal rebel attack on the nearby town of Kamouna. 2015.07.24 The Nigerian army said it recaptured Dikwa from Boko Haram, though the town had already been reported secured by Chadian forces in March. 2015.07.25 Boko Haram attacked the island of Médi Koura among the fragmented remains of Lake Chad, well within the borders of Chad itself. The attack would be followed by major military campaign and heavy fighting in nearby areas, as Chadian troops attempted to drive Boko Haram forces entirely out of the lake region. 2015.08.02 The Nigerian army said it rescued 178 prisoners from Boko Haram, most of them children and women. The 200 missing girls infamously kidnapped from Chibok in 2014 were not among them. 2015.08.21 An army source reported that troops had driven Boko Haram fighters out of Gudumbali. 2015.09.01 Nigerian government forces captured Gamboru-Ngala from Boko Haram. The twin towns had been secured by Chadian forces months earlier, but not protected from subsequent rebel incursions. 2015.09 In early September, Boko Haram fighters began attacking communities on the border with Cameroon after being flushed out of the Sambisa Forest by a heavy government bombing campaign. The attacks included the storming of a market in downtown Kirawa, a town known to have been under Boko Haram control in the past. 2015.09.19 A military spokesman said Nigerian troops had captured Jerre and Dipchari, on the road to Banki. 2015.09.20 A Nigerian newspaper reported that Boko Haram was operating a checkpoint on the road between Gwoza and Limankara, killing any travelers who did not have food to offer to the rebels. 2015.09.22 Nigerian troops cleared Boko Haram fighters from camps in Jangurori and Bulatori, near Bama. In the process a high-level Boko Haram leader was captured. 2015.09.24 The Nigerian military said it seized Banki, on the border of Cameroon, with cooperation from the Cameroonian military. The next day, "at least 200" Boko Haram fighters allegedly surrendered to the government forces. 2015.09.23-25 Madagali, at the northern tip of Adamawa state, was reportedly abandoned by its population after three consecutive days of Boko Haram raids. 2015.10.07 The military claimed that over 100 Boko Haram fighters were killed in a failed attack on troops in Goniri, on the Borno-Yobe state line. 2014.10.08 An open letter from displaced residents to President Buhari said Boko Haram was in control of a number of villages east of Gwoza, including Ngoshe, Attagara, Kirawa, and Kughum. 2014.10.10 Dozens were killed in a Boko Haram attack on a fish market in Baga Sola, on Chad's side of the border. 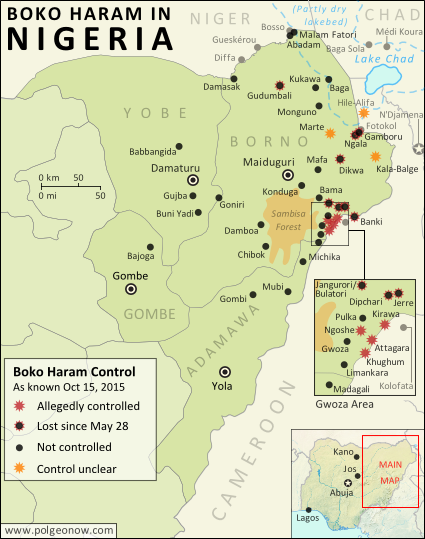 2015.10.14 The US announced it was sending 300 troops to Cameroon to assist in tracking down Boko Haram fighters. Following this story? 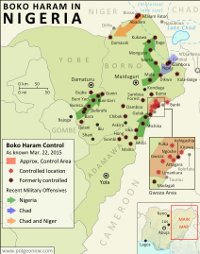 View all Boko Haram maps on PolGeoNow! Categories: africa, boko haram, cameroon, chad, conflict zones, divided countries, isis, niger, nigeria, original maps, rebel control, the "islamic state"